Technically I'm on here for my girlfriend's car. It's a 91 vert. Got around 170k. It has been neglected before she purchased it. It's now in her(our) hands. Since day one it has had check engine light issues and trying to cut out. Got most of that fixed. Since she has had it. (roughly a year) Fuel pump has been replaced, new plugs, new wires(had original 1991 wires in it), new radiator(also original), new driveshaft (front ujoint almost broke in half), new shifter bushings and boots, re-sealed injectors, new primary fuel rail/pulsation dampener. (Had a fuel leak). Fixed the botched hid headlights and fog lights. Has regular sealed beams in it (silver stars). Sourcing some fog light caps so oe style bulbs can be used. I'm sure I'm leaving out some things. I'll post a few pictures of her car when I can. Re: Making a 91 vert great agian. 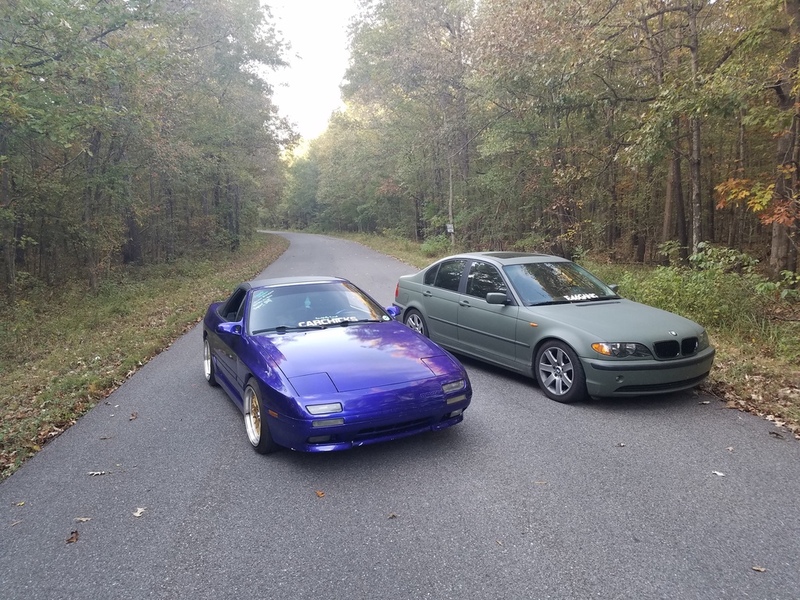 Picture of my girlfriend's fc and my e46. Lots more pictures will be coming soon. making mount for psp in vert..
My Cars With Me Agian! making the stock twins non seq???? Quick Reply: Making a 91 vert great agian.